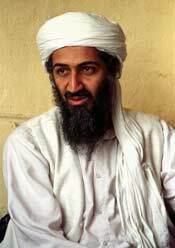 Terrorist mastermind and Al Qaeda chief Osama Bin Laden has accused Jordanian terrorist Abu Musab Al Zarqawi of taking the spotlight away from him. "Frankly speaking, he has stolen my thunder!" complained Laden in an interview conducted over satellite phone. "All you hear now is 'Zarqawi did this' or 'Zarqawi did that.' It seems as though 911 did not happen at all. I am right here in Afghanistan and they went after my organization in Iraq! Why are they doing this to me? What did I do wrong? When will the Americans come back for me?" When this reporter asked if Zarqawi was one of his trusted lieutenants, as the U.S. military claimed he was, Mr. Laden replied in the negative. Asked if he knew Zarqawi at all, Laden said, "I don't know. I'd seen thousands of terrorists. They all look the same - with bad haircuts and unkempt beards." So, is Mr. Zarqawi pure fiction? "Maybe he is. Maybe he is not. Maybe he is just a guy operating from the Pentagon basement. Every time they attack civilians, a military spokesman releases a statement saying that the attack was targetted insurgents loyal to Al Zarqawi. This is much better than saying they killed a bunch of Iraqis. Zarqawi is a foreigner, so it is the perfect way for them to discredit the resistance and say these attacks are not coming from the Iraqi people. They can now blame everything on Zarqawi." "It is similar to how we blame everything on the Jews." So, why doesn't his organization disown Zarqawi? Laden retorted, "Why should we? When Iraqi victims see that they are portrayed as members of the Zarqawi terror network, more numbers of theirs will join the insurgency." "What bothers me however is the fact that the focus has shifted to Iraq and everyone is talking about Zarqawi. It is as though I don't exist at all. Do you know how important public attention is for a terrorist?" "When the Americans were bombing the Tora Bora caves, I thought I was going to die and released a statement saying that I would go down fighting. It was a stupid stupid mistake. I played the martyr card a bit too early. Now, everyone takes me for dead. If this goes on for long, I might as well surrender or let myself be captured."